Please note payment is taken at point of order and we will usually have your goods with you within 7 - 10 working days once availability is confirmed. Should there be a significant delay we will contact you via e-mail, therefore please ensure you have entered a valid e-mail. The e-mail will request whether you require the choice of either choosing a different shade or style or waiting for the order to arrive. Free delivery is sent by 2nd class post. If you are requiring an item quicker we do offer a Special Delivery at a cost of £8.50 (please note we are not a stockist and order in daily for several suppliers). If you choose this option at checkout you will receive the goods the next working day after you have received a dispatch confirmation email from us. We also offer a 1st class option. If you require an item by a specific date please contact us and will do our best to get the item to you. Sale goods can be despatched within a few days. If you do not receive your parcel after 15 working days you must notify us for a lost parcel claim, which can take up to 30 days.If you have a multiple order please email for special postage prices. Outside UK delivery can vary from 5 - 21 days onwards, depending on your country's national postal system. We do offer Courier services for international orders but not liquids/sprays etc due to airline restrictions. We now offer shipping to the USA. Due to Royal Mail posting regulations only upto two sprays can be placed in one parcel. This is due to the alcohol content in the product. Under the UK Distance Selling Regulations June 2014 you have 14 working days from the day following receipt of the goods in which to cancel this order. Cancellation may be made by phone or email. You need to notify the retailer of your wish to return your order within 14 days upon receipt of your goods. You then have a further 14 days from the date you notify the retailer of your return to return the goods.Any goods returned outside of the 14 day returns policy cannot be refunded. You, the consumer will be responsible for paying for the returned goods, we recommend that a receipt of postage by the Royal Mail for Special Delivery or Recorded Delivery. We do not refund courier charges. When sending your return we would ask that the goods are sent back in the original packaging, with outer protection, such as a box; in the same pristine condition as was sent to you, with the HANG TAG attached and not cut. We ask that you take reasonable care of your wig/hairpiece in not exposing the wig/hairpiece in a room where people smoke and that the wig does not come into contact with food smells, perfume or other odours. If you return sprays, shampoos or other sundries, these must be un-used. We cannot accept wig caps that have been tried on. Due to the personal nature of wigs and hairpieces and for hygiene reasons we are unable to exchange or refund payment on wigs or hairpieces that have been worn, cut, brushed or restyled. If you are not satisfied with the condition of your goods, please return for inspection. Any replacement for the said goods can only be given after inspection, if we feel the goods are not up to their usual standards, we will return them to the manufacturers on behalf of you, our client. Please note our quality control department inspects all goods before delivery and is counter inspected by a second person and signed as pristine.We ask that you return your delivery note with the package, this will allow us to refund your account quicker as it has your name and reference number on it.If your returns comply with the Distance Selling Regulations, you will be granted a full refund. Please allow approx 10 working days from receipt of a return for us to process a refund. Once a refund is processed you will receive an email confirming this, the email will be sent to the same email address where your order confirmation email was sent. This timescale is dictated by your bank or card issuer and is outside of our control. (N.B Your refund will be credited to the same card with which you made your original purchase. If you have selected courier charge or have paid postage on your order this amount is not refundable. If for any reason this is not possible, for example the card had been declined or has expired, we will call you for your new card details. We welcome you to arrange an appointment for a consultation. Please telephone 01964 631199 between 9.30am - 4.00pm. Any wig that is purchased or worn as fitted when leaving the premises cannot be exchanged. We cannot accept visits without prior arrangement due to privacy. Fittings are free of charge but any cutting or re-styling will incur charges of up to £25.00 per wig. We have the right to refuse any cutting if we do not feel the style requested would be suitable for the said wig. We often run special offers and discounts, if you have a personal discount granted to you, these temporary offers cannot be further applied. Yes,Wigs and Pieces is happy to help you select the right colour by matching your hair sample to the closest available wig/hairpiece colour. Please tape a piece of hair to a white A4, and if there are two shades to match, please state the dominant shade. Send this with an enclosed letter, stating which piece or wig model you wish it to be matched to. Please send to the address below, with email and telephone details . In the unfortunate rare incident of a faulty wig or piece, we will accept this return for inspection by our qualified team, if deemed faulty, we will replace the goods. Wigs and Pieces reserve the right to cancel any order before fulfillment. All goods remain the property of Wigs and Pieces until goods are despatched. We reserve the right to amend the Terms and Conditions at any time, it is up to you the consumer to read the said terms before agreeing to purchasing the goods. If any pricing error occurs either by the software or by human nature, we reserve the right to change the prices accordingly and to cancel your order. 3D Secure, protects your MasterCard or Visa card against unauthorised use when you shop online at participating retailers. This simple service enables you to validate transactions you make over the internet by supplying a personal code. You do not have to contact your bank for this service, this is not your pin number from your cash machine, this is a unique personal number, you create to prevent fraud, if you have not already enrolled for this service, click the link, where it says I am not enrolled and you can do this online. Each time you shop on the internet, it will ask you for your enrollment pin, this is to stop fraudsters using your card. What is 3D Secure ? 3D Secure is a service to enhance your existing Mastercard or Visa Account. You enrol for the service with the bank that issued your card. During the enrolment process you choose a personal code and a personal greeting. After enrolment, you will be prompted for this personal code anytime you shop at a participating online merchant. When you key in your personal code your card issuer validates that the correct code has been entered. Your card issuer is responsible for validating and safekeeping this code so the merchant never has visibility or access to it. 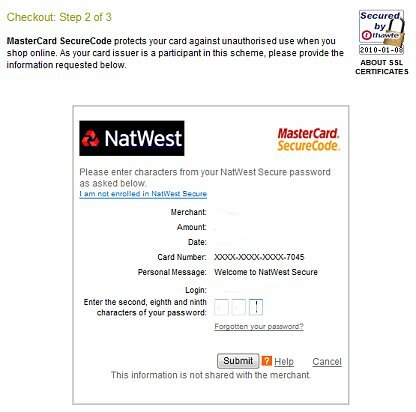 When you correctly enter your 3D Secure personal code during a purchase at a participating online merchant, you confirm that you are the authorized cardholder and your purchase is then completed. If an incorrect code is entered, the purchase will not be completed. Even if someone knows your credit card number, the purchase cannot be completed without your personal code at participating merchants. What happens when I use my personal code at a participating merchant? When you make a purchase at a participating merchant and enter your registered card payment details, you will automatically be prompted by your financial institution to enter your personal code. There is no need to login or sign in to 3D Secure. After reviewing the details of your purchase, you simply type in your personal code to complete your purchase. Can I still use my card on websites where the merchant is not participating? 1. Contact your card issuer to find out if they offer 3D Secure. 2. Follow your card issuers instructions to enrol your card in 3D Secure. 3. Enjoy shopping with comfort and security with participating online merchants. We use Royal Mail 'International Tracked or Signed For services to deliver your goods (approx 10-21 days) if your goods are in stock, you will be informed by e-mail if there is a delay, please ensure you use a valid e-mail If you have any further enquiries please contact Wigs & Pieces. Please note that Wigs & Pieces is not a shop, it is primarily an internet based mail order company. However, we are available for private consultations via prior arrangement. The telephone lines are open from Mon - Fri 9am - 4.00pm, call ( 01964) 631199 to speak to one of our team.